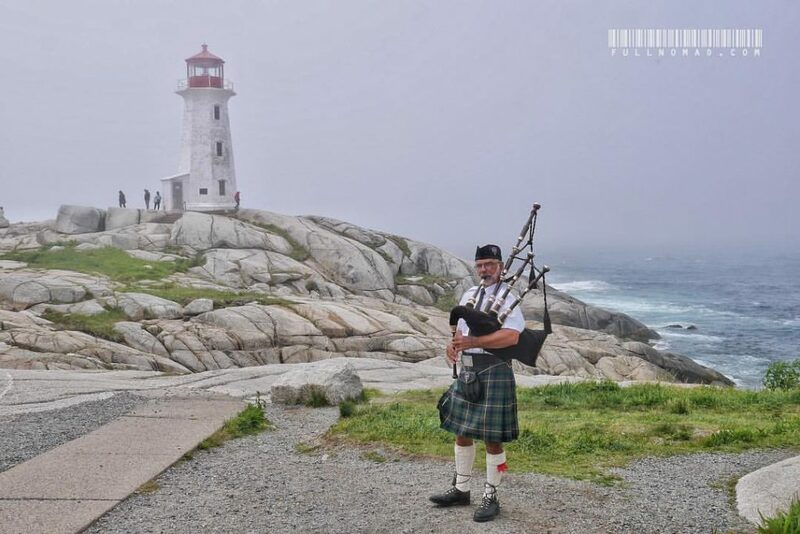 This is part two of my Nova Scotia adventure, this one focusing on Peggy’s Cove. Part one is here. Normally, I don’t do “travel round-ups.” My opinion is that you should learn about places from locals, not people parachuting in who vanish shortly thereafter. But two things prompt my Nova Scotia focus. One, their economy is awful but the people are wonderful, and the outflow of locals over recent decades means they have infrastructure to handle tourism, and I want to help. Two, this is my country, my land, and my people come from the East Coast, and this is my first time processing my ancestry. At the time, I was disappointed to see fog for my daytripping, but in hindsight, I’ve seen sunny photos of Peggy’s Cove and they just don’t seem as “right” as fog does. Driving Nova Scotia’s roads felt comforting yet unfamiliar. Heavily forested, trees are omnipresent, so much so that a beachfront cabin property I passed had a sign reading “Sick of trees yet? We got beach!” But these were the short and stunted fellas I grew accustomed to in the Yukon. 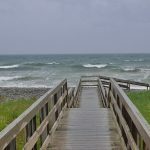 Only, instead of surviving in Yukon permafrost, Nova Scotia’s pines were battered by Atlantic winds over short growing seasons. 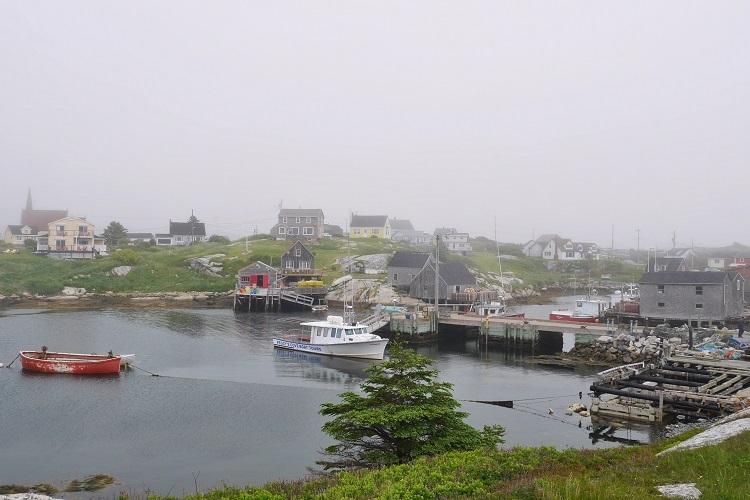 Fog and grey skies socked the island as I wound my way to Peggy’s Cove. The mood outside suited mine, muted and unclear. 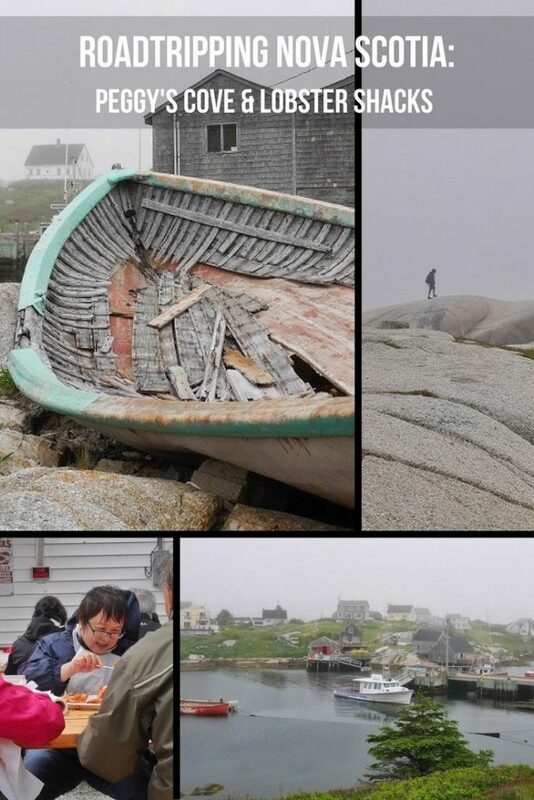 Peggy’s Cove was ground zero of a different tragedy. Swissair Flight 111 met a watery grave off the embattled fishing town, where the plane dropped from the sky and 229 people died. (An investigator in 2011 may have brought it down.) The town cared for grieving family members who flew in to see where their loved ones met their demises. It was obvious by her ashen pallor and steely eyes that the woman correcting my mistake had been profoundly touched by the events. She seemed too affected and jarred by my ignorant insolence for me to bother her with questions I felt would now seem gawky and pestering, so I apologized and thanked her for correcting me. Later, my online research told how the memories of those alive then still ache today with recollection. They speak of houses shaking, deafening booms. Twelve-hour days sorting through debris and human remains for over three months, well into the freezing days of December, 1998. They speak of collective grief, therapy needed, mourning with visiting families. It seems cruel such a small, depressed town should be saddled with the oppressiveness of such loss and destruction, but a fishing town with a lighthouse is probably exactly the kind of place that understands the pain of a watery grave. Anyone who knows maritime history knows lighthouses were erected in places known for shipwrecks. Peggy’s Point Lighthouse, internationally famous for good reason. It couldn’t have been a more perfect weather welcome. Peggy’s Cove was somehow inspiring and beautiful, despite peace and sedation splashing around with all its sadness and loss too. The Cove resonated with me. Only a few places in the world that I’ve visited have had emotion crashing over me in waves, and Peggy’s Cove was one. My reaching the rocky cliff face in a shroud of fog while a kilted man played his bagpipes was as fitting an arrival as I’ve ever had. I choked back tears on those rocks, as I marvelled about the small moments of greatness my life as nomad entails. Often asked “what’s your favourite country,” I’m forever replying that it isn’t a country, it’s moments. It’s moments that find me in love with our world, swirling and conflicting emotions, grateful for courage and presence and luck. It’s moments filled with beauty and culture and difference. Moments. 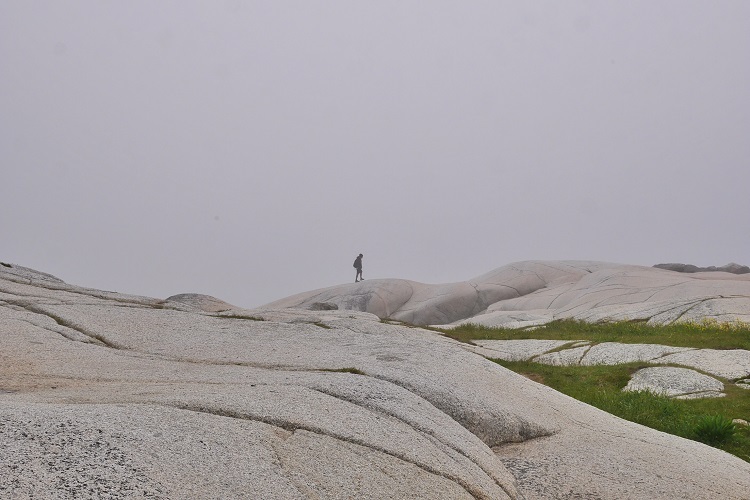 Those moments in Peggy’s Cove felt deeply personal to me. Maybe it’s my Scottish heritage. Maybe it’s because my people have lived by the seaside for centuries. I don’t know. But it felt personal and it felt like home. Grudgingly, I returned to my car, because I could’ve sat on the rocks there for a couple hours, just thinking about life. But still awaiting me was a long ride to Lunenburg, and much to see. The landscape of Peggy’s Point is phenomenal. These rocks are vast and wide-reaching. More than a few people have been too keen and gone below to the black rocks, slipped, and fallen to their deaths, so when the signs say to be careful, listen. Unlike my normal nomad life, where I generally slow travel, this was “vacation” and I planned as much into a week as I could, much to my later chagrin. I left Peggy’s Cove too soon, driven by a false deadline I self-assigned. It’s the rush so many vacationers condemn themselves to experiencing, and it’s a disappointing travel experience. See? Sometimes even the slow-road nomad over-plans. And part of that means regret for missing things, like the memorial to the Swissair 111 dead. I wanted to go, but I was torn. 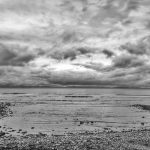 The Dead Dad grief I’d been wrestling with had finally evaporated that morning, and I couldn’t bring myself to confront more death and loss. So on I went in my not-so-thrilling rental Nissan Versa. Canadian classics like the Tragically Hip and 54-40 played as I wove again through tree-flanked seaside roads and the fog that came with. Just outside of Peggy’s Cove, my progress was halted by first-ever roadside lobster shack. Here’s the thing: I hate seafood. All my life, I’ve turned my nose up at it. Except for a brief span in 2008, when I was losing weight and exploring healthier options, until I got food poisoning for three days from tuna and swore I’d never eat fish again. Roadside lobster, where they steam the lobster in actual seawater, and serve NOTHING ELSE, except butter? Yeah, they’re gonna cook it right. This woman made me happy. 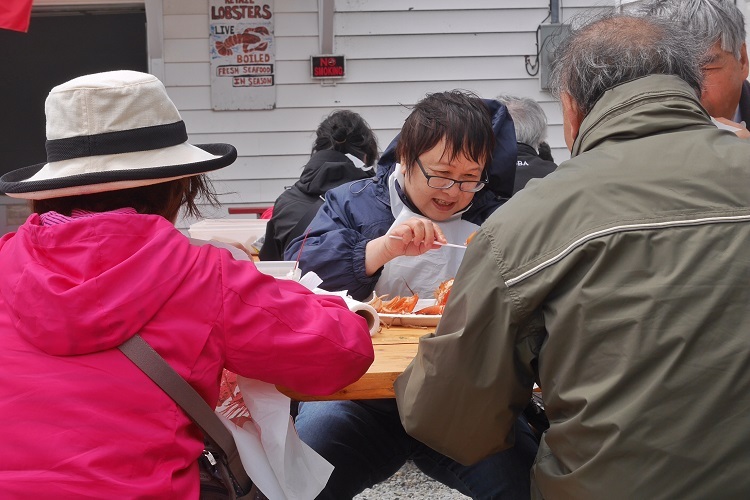 Nattering away in her Japanese as she barely made eye-contact with others, picking out all the lobster she could. So, I pulled in. Surprisingly, I was the only fish-belly-whitey there. A busload of very keen, chatty, happy Asians were all tucked into their lobsters with their plastic lobster aprons tied around them. I couldn’t understand a word they said, but they looked happy. And if anyone knows seafood, Asian tourists sure do, so their obvious approval seemed a good sign. The staff at Ryer Lobsters quickly learned how apprehensive and worried I was about lobster. They suggested a male lobster so female roe wouldn’t make me even more squeamish. They promised to crack it for me and demonstrate meat-extraction techniques. A doughy, charming lady in her 60s took my money and gave me a how-to-eat-lobster primer sheet as she talked me off the anxious lobsterry cliff I teetered on. I hung out at the picnic tables. Occasional gusts veered up from the ocean so I weighted all my things down as I settled in. Time was killed watching an adorable woman across from me nattering away in Japanese as she attacked her lobster shell. Whoosh, the wind blasted us all and her companion’s plate caught an updraft on the edge of the picnic table. The plate somersaulted through the air and lobster bitsies, with paper pots of melted butter, landed over all his table-mates. I couldn’t understand their excited chatter in the chaos, but delighted, surprised laughter sounds the same in every country. As they tidied up, my freshly-steamed lobster emerged. The other counter lady ambled up. 60s, bottle-strawberry-blonde, raspy Maritime voice. “So’s I’m gonna show you how to do this,” she said. I got over myself and got into the lobster, and I’m thrilled I did. That fluffy, warm, saltwater-steamed lobster surpassed any I’d eaten elsewhere. It was end-of-season, fresh off the boat, and I’m a fool for not having more. If driving down Route 333 or Peggy’s Cove Road and you see an understated white building emblazoned with “Ryer’s Lobsters,” don’t think twice. Just do it. If you don’t like lobster there, you won’t like it anywhere. My seafood journey would continue in Lunenburg, for which I had to get back in my car and motor. In the next few days, I’ll post Part Three, Lunenburg.